Tooth loss can occur at any age and for a variety of reasons. Some people have missing teeth because of severe tooth decay or serious injury. For others, the reason is advanced gum disease that necessitated tooth extraction. Why you have a tooth missing is less important than making sure you have a tooth replacement. At Mod Squad Dental, Dr. Greg Friedman and the team use dental implants Scripps Ranch residents can count on to renew their smiles and provide strength and security when they chew and speak. While there are other excellent choices for tooth replacement—crown and bridge, partials and full dentures—dental implants offer a distinct advantage. While these other options merely rest on top of your gum ridge, dental implants go much deeper… literally. With this tooth replacement, Dr. Friedman carefully positions a titanium post in your jawbone. To make sure the implant is precisely where it needs to be, we use a CT scanner that provides a detailed 3D image of the area. More than a standard 2D x-ray, a CT allows Scripps Ranch dentist Dr. Friedman to see exactly where there are nerves and bone tissue, so he can select the best type and size of implant. The entire process of restoring your smile with dental implants will happen right here in our San Diego dental practice with the dentist and staff you are familiar with. That’s often a comfort, however, some of our dental implant patients need a bit more help relaxing. We understand and offer conscious sedation with a mild anti-anxiety medication. Once you are settled, Dr. Friedman will anesthetize the site and place the designated number of implants you need in your jaw. If you have more than one missing tooth, then Dr. Friedman will strategically position several posts in order to securely support an implant-retained denture. 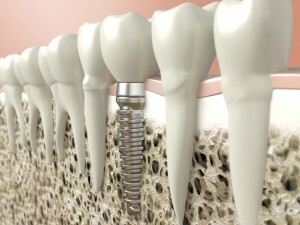 After the implants are placed, a healing period of a few months is usually necessary. During this time, your implants bond with the surrounding gum and bone tissue, thereby creating a stable foundation for your tooth restoration. When you’ve healed, Dr. Friedman will attach your new, natural looking porcelain crown or implant-retained denture. To find out if dental implants are the right tooth replacement for you, contact Dr. Friedman, the Scripps Ranch dentist.